Come to our studio or upload your own photos to us. 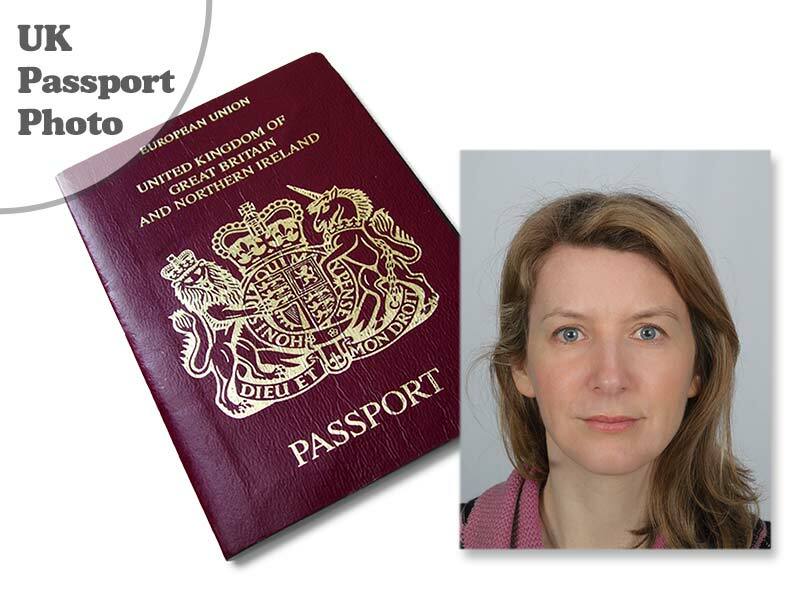 The current UK passport photo has to meet many specifications. 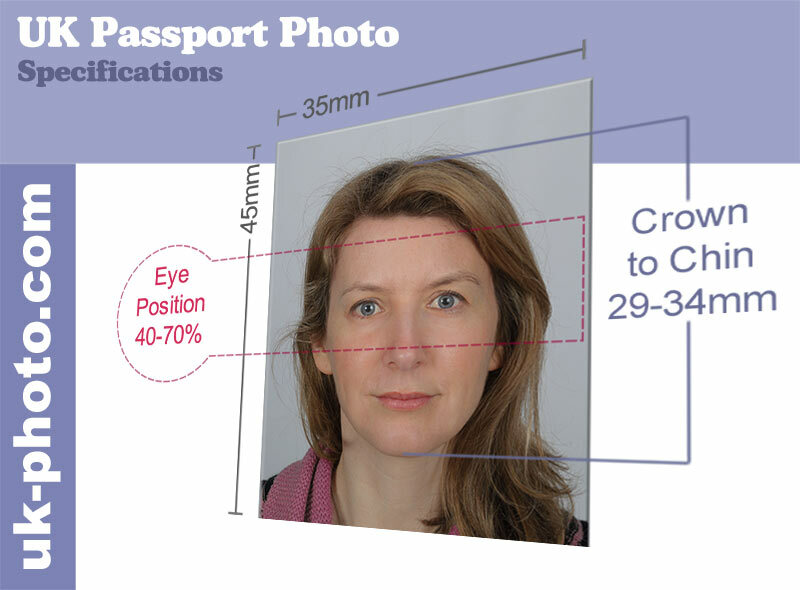 We guarantee that our photos will pass all of the passport office regulations. No glasses should be worn if they incur reflections. or by using the booking form below. If you cannot attend our studio, you can upload your own photos using the form further down this page, and we will convert them to the required standard. You will receive a set of 6 photographs (additional sets cost £3.00 per set). You will also receive either the image via email, or a special code. These options allow you to apply for you passport online via the government's website. There is no additional charge for this. If you have any questions regarding our passport and visa photography service, please enter them in the box above. 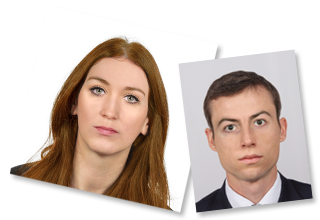 Booking is not essential, but If you would like to book a time slot for your passport photographs, fill in your details above. If we are busy at your chosen time, we will propose an alternative time. Enter your email or telephone number so that we can contact you. You can use the form below to upload your own photographs. Simply fill in your details, then click on the 'Upload Photos' button. You can upload several photos, and photos of more than one person at the same time. Once you have sent your images to us, we will inform you of their suitability. If they are suitable, you will be sent a link via email to our secure payment page, so that you can pay for your photos. Upon receipt of payment, your photos will be mailed to you immediately by first class post. Once you have entered your details, click the Upload Photos button. Just state the country and any other details you consider relevant. It is best to send a few photographs. That way we can pick the one that is most suitable. 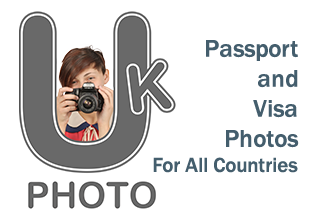 Once we have received your suitable photos, we will send you a payment link and post your photos on receipt of payment. Eye glasses should not be worn if the frames are small or the lenses reflect the flash light. Scarves and other head gear should only be worn for religious reasons and should not obscure any of the face. Facial expression must be neutral with the mouth closed. No teeth should be visible. The rules for children who have not yet reached their 6th birthday are relaxed. The mouth can be open with a non neutral expression. For individuals with mental, physical or behavioural problems, the rules are equally relaxed. Though, if the condition is not obvious in the photograph, you should include a note indicating the circumstances and this should be signed by the parent, carer or the subject's doctor. The government department supervising immigration control and the policing of border entry points such as airports, sea ports and the channel tunnel. Issued by local councils to allow people with disabilities to park in areas closer to amenities and public buildings. When applying online, we can supply you with a code that can be entered on the government's website. This is ideal if you don't have an email address. If you have an email address, we will simply email the photo to you so that you can upload it yourself. The government department responsible for the issuing of driving licences. Non EU citizens living in the UK will require a BRP. The organisation that sets the standards for biometric passports (ePassports). Facial, fingerprint, and iris recognition are common elements. Our studio is on the first floor of the Broadstone Mill Shopping Outlet. The Mill lies between Stockport and Manchester. We will show you the photos on the camera's screen and we will take several more if you are not completely happy with the image. Once you are happy with your picture, we will process your photographs. In the ten minutes it takes, you can browse around the store or go for refreshments in the cafe or tea rooms.